You are here:Home-LS Fest West, Uncategorized-Mr. Chow’s Side Show is coming back to LS Fest West for 2019! Mr. Chow’s Side Show is coming back to LS Fest West for 2019! In 2018 Holley brought Mr. Chow’s Sideshow to Vegas at LS Fest West. A side show pit was built, professional safety precautions were in place and the party went down! In 2019 it’s coming back bigger and better with the backing of the crew at Sac Speed Shop! More cars will be on site roasting their tires for the fun of it and showing the crowd their skills behind the wheel. We will also be crowning a King of The Pit this year AND we will run a late pit session into the evening Saturday! In addition, Sac Speed Shop is hosting a feeder event at the Sacramento Raceway in Sacramento, CA on March 23, 2019. 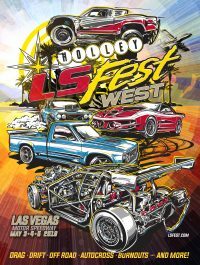 They will haul the winning car to LS Fest West Free of charge, so be sure to get there and register for LS Fest West today! Preregister for the side show at the link below. There will be a tire changer for those who end up needing to install a fresh set to continue their side show, drifting, or drag racing efforts through the course of the weekend. That service will be provided by S&S Tires. That service will be provided by S&S Tires. Small fee will apply. Racer will be responsible for their old tires. Click here for more information on the Side Show and click here to register!